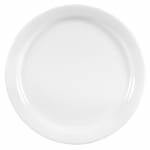 The World Tableware 840-425N-13 plate is 9 inches wide and features a narrow rim, maximizing the area you have to work with when plating food. The bright white finish gives this plate a modern appearance and allows it to fit in with a wide range of color schemes and décor. As part of the Porcelana™ series, this plate is made of porcelain and has a low profile at only 3⁄4 inches high. Overall Dimensions: 3⁄4 in. H x 9 in. dia.